EAST LANSING, Mich. (AP) — The NFL can wait for now. 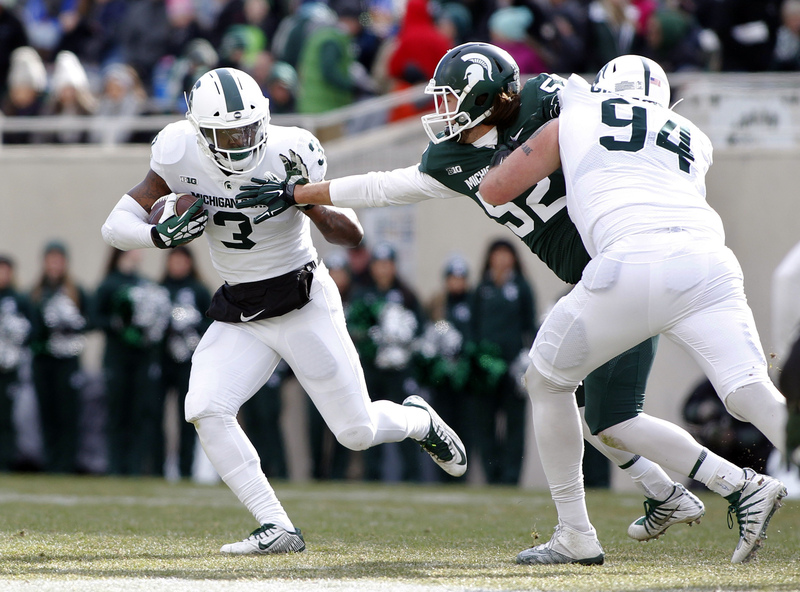 LJ Scott is back at Michigan State with a list of areas he’d like to shore up. Scott’s return after his junior season was big news for the Spartans, who now look like Big Ten title contenders in 2018. After three consistently productive seasons in East Lansing, it wouldn’t have been a big surprise if Scott had turned pro, but he decided to come back to Michigan State — and now he sounds like he’d welcome a bigger workload this year. The 11th-ranked Spartans open the season Friday night against Utah State. Scott rushed for 699 yards and 11 touchdowns as a freshman in 2015, and he scored the winning TD in the final minute of the Big Ten title game that year. Since then, he has remained an important part of the offense, although he has yet to rush for 1,000 yards in a season. His receptions total inched up to 20 last year, but that wasn’t a huge part of his game. Part of the reason Scott now expects a bigger role is because Michigan State no longer has running backs Madre London and Gerald Holmes, who combined for 162 carries a season ago. Holmes was a senior, and London transferred to Tennessee . Scott ran for 898 yards on a career-high 201 carries last year. He also fumbled five times, so that’s another area in which there’s room for improvement. With running backs, there are often concerns about longevity. It’s never too early for a player to think about wear and tear — and whether extra carries in college can mean fewer in the NFL down the road. It’s easy to see why a player would want to reach the pros as soon as possible. For example: In 2012, Michigan State’s Le’Veon Bell had 382 carries, the most in the FBS. Then he skipped his senior season and went to the NFL. Scott hasn’t had anything close to that kind of workload. Michigan State could have a pretty balanced offense this year with quarterback Brian Lewerke orchestrating the passing game — and Lewerke’s running ability also takes some pressure off Scott. Certainly Scott understands that he has signed up for another season of hits from collegiate defenses. Scott has been pretty durable. He has missed only one game in his Michigan State career — a win last season at Michigan. The weekend after that, he ran for 194 yards on 25 carries at Minnesota. In November, he had 29 carries for 147 yards against Maryland. He finished last season with 110 yards rushing in a Holiday Bowl victory over Washington State — then indicated in a Fox Sports 1 postgame interview that he planned to come back for his senior year. That was welcome news for Michigan State fans.